I've been tagged by a wonderful writing friend Kathryn Apel. Kathryn created a wonderful writing forum called 'Month of poetry' that occurs in January . Look here to see what happens. I participated in the first year of poetry writing- inspiration to keep those words flowing- thank you Kat for the energy and selflessness given to get such an initiative off and running. Kat is all greatly excited by the publication of her first verse novel due out this year with UQP called "Bully on the Bus." I'm looking forward to reading this book. Well done Kat, I've always appreciated your enthusiasm and passion for poetry as well as your friendship. Have a look at Kat's blog to read her 'tagged' entry. So the answers to the famous 'tagged' questions from me. Ah, this is a tricky question. I have to try several projects at once so: I’m working on a historical novel that has been evolving for (gulp) several years, a junior novel, editing my next poetry collection due out 2015, re writing a verse novel( gulp) again written two years ago and not quite there yet. Well that’s a challenging question. I think it’s a matter of voice, the culmination of years of writing, reading, and sending work out, refining. But ultimately I believe its passion for one’s genre and that passion leads to research, reading and hunting for every grain of relevant information on craft that one can find. And lastly writing what really matters to you. I HAVE to write, it makes my heart sing, and my whole day clouded if I haven’t written, yet why do I let other projects come into between me and my laptop??? I believe I have been given a gift to use, I believe in spreading the word about literacy; I believe in helping others who struggle with literacy having been in that position as a child; I believe writing alters the world for good; I believe that by writing one discovers who one is and what really matters, culminating in that wonderful creative moment when all threads and ideas mesh and meld into an incredible story or poem. Ha! Wish I knew too! No, seriously I hand write my poems into a journal, but stories can gallop or take snail pace across the white screen of my laptop. I write ideas down in my journal, I switch from one story to the other in the progress of a morning’s work- I haven’t yet been able to focus exclusively on one story. My thoughts meander and come up with plausible ideas for characters to take, but incredibly my fingers tap out a line of surprise action and I deviate. Then I might come to a stalemate. That’s the time I switch to an ongoing different story. My stories start with a character, an emotion, a setting. I have great difficulty planning, I just can’t sit long enough to do that, it seems so uncreative; yet to write a bigger novel, (which I want to do) I know I need planning. I have started a journal of clippings and research ideas for my historical novel- always researching for these. I love history. Poetry is also extensively researched so that each poem becomes a mini canape of rich taste. When I become disillusioned I look back over the poems, stories and books that have been published and remember the down times in these and know that I can push through again and again. So now it comes time to reveal my tagees- wonder if there is such a word? Another of my writing friends: Janeen Brian. I've known Janeen for a long time now and invariably she inspires me with her creativity, perseverance and generosity. Here's a little bite sized introduction to Janeen's work. I still find it amazing that I’m a writer – but it’s words I love, so words it is! They’ve created over 85 published books and hundreds of poems and stories in children’s magazines. Many of my books are award-winners (Where does Thursday go?, Hoosh! Camels in Australia, Pilawuk – when I was Young). Others have been translated. 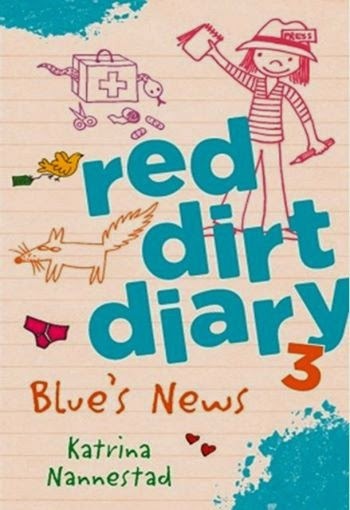 My latest titles are Eddie Pipper, Meet Ned Kelly, That boy, Jack & I’m a Dirty Dinosaur. Coming up are: Our Village in the Sky, Where’s Annie, I’m a Hungry Dinosaur and Silly Squid! I’m also the writer for a forthcoming dance performance for babies 4 – 18 months, called Nursery. 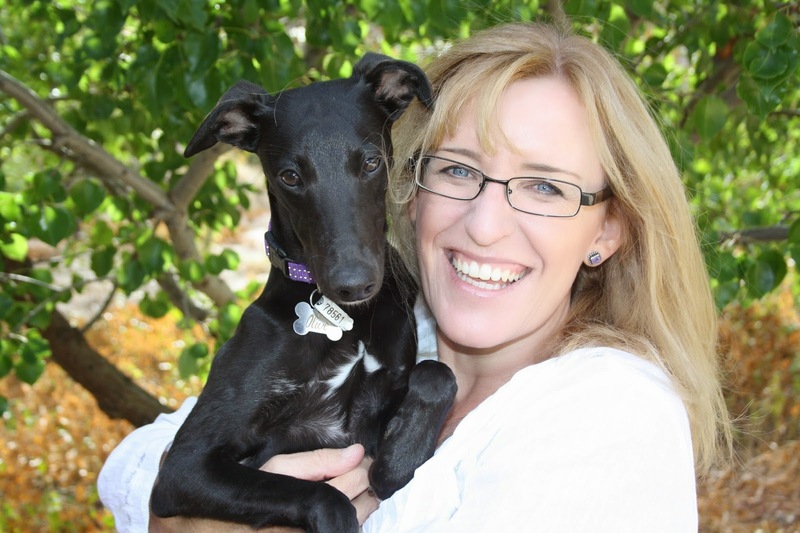 Janeen will provide her tagged answers next week- meanwhile dash over to her blog and read the latest offering. My second tagged writer is Rebecca Newman. Rebecca created a wonderful magazine for children 'Alphabet Soup' and of course I wanted to submit poetry. Rebecca published two of my poems and interviewed me for an author spot in the magazine. 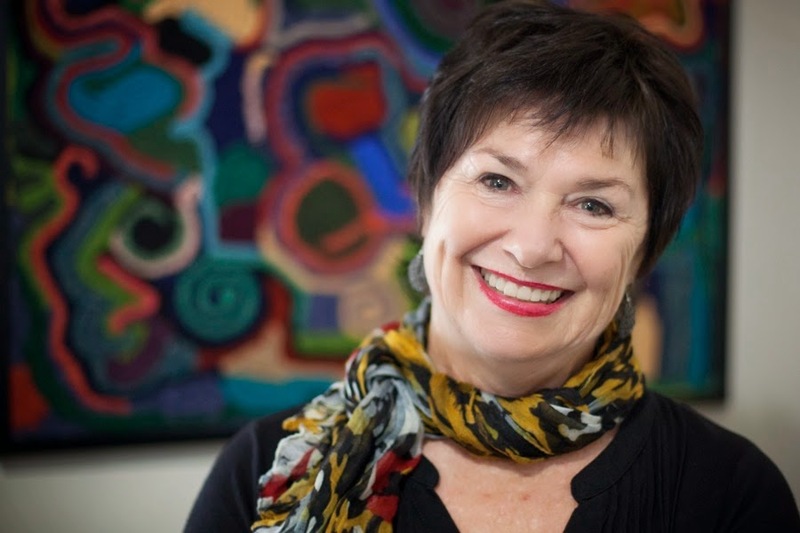 Rebecca is another passionate poet and lover of children's books. 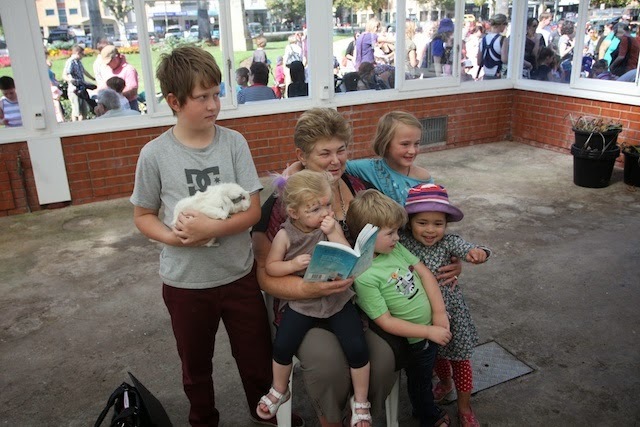 Her site Alphabet soup blog contains book reviews ( by children) and often children's writing. A visit is a must. Thanks for agreeing Rebecca you are a valued and admired writing friend. 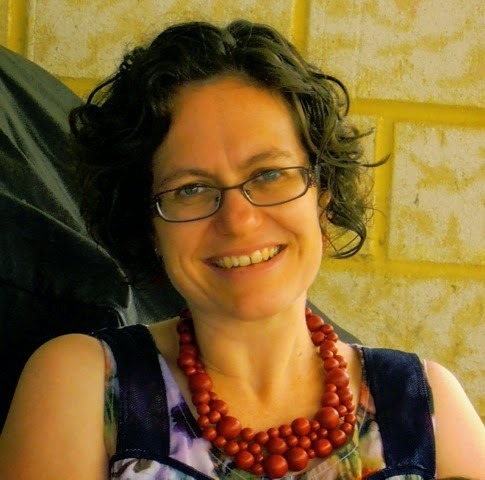 Rebecca Newman is a children's writer and is also the editor at Alphabet Soup’s Blog (http://soupblog.wordpress.com). She writes picture books and children's poetry, and plays poetry tag with another children's poet over at the Poetry Tag blog. (http://poetrytag.wordpress.com) The School Magazine will be publishing her poetry in 2014. Rebecca lives in Perth, Western Australia and when she's not busy writing she loves reading and looking after a tiny kitchen garden — sometimes at the same time. Look out for Rebecca's tagged post at http://poetrytag.wordpress.com next week. 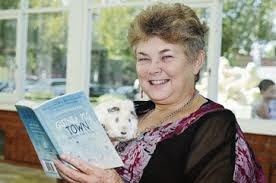 Last but by no means least is a new writing friend Katrina Nannestad, who is a lovely Bendigo author. We have just linked up and I can't understand why we haven't done this long before! Not only that we both have new puppies!!! Above is Kate and Oliver! Kate writes novels for primary school children. She writes with cheeky humour. Here are the covers of some of her recent books. 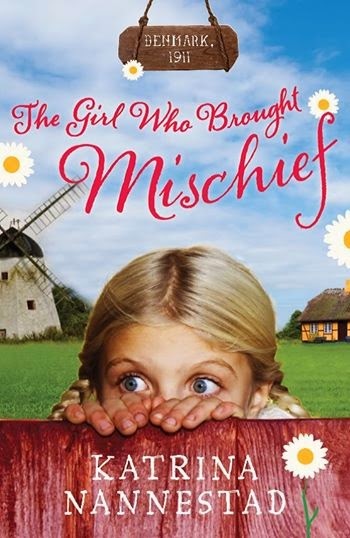 I enjoyed immensely the 'Girl who brought Mischief'- the sort of title I like! Here's to many more books Kate. Wonderful to read, Lorraine. Your writing process reminds me of a dance - steps here and there, and then finally the glorious whole! Thank you for inviting me to be the one-next-tagged! It's so much fun reading about different authors' writing processes - and finding much to relate to. I love what you've said about what makes your writing unique. That was the hardest Q, I think, and what you've said is so true. 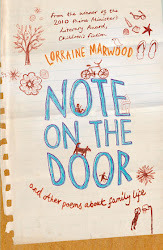 Thank-you for your lovely words - both on the blog, and in your books. You poetry is a feast to the senses. I can't wait to read your historical novel. And I love that there's a guinea pig in your blog post!! Long live gorgeous guinea pigs! Janeen, an apt description, not sure my writing process is as graceful or as economical as dancing! I look forward to reading your tagged comments! Kat, thanks for tagging me- we learn so much about each other's craft!